Our single journey fares are available to buy on-bus, and your fare is calculated based on the distance of your journey. Each route in our network is divided into multiple fare stages – travelling within the extent of one stage would incur a Short Hop fare, whereas travelling between multiple stages would incur a Max Single fare. The easiest way to find out how much your journey will cost is to ask the driver. Simply state your destination and your driver will tell you the fare required. If you are making more than one journey per day, you may find it easier and more cost-effective to purchase a Daysaver, which is valid for travel all day on all services in the Xplore Dundee network (on the date of purchase). Young people get cheaper travel as standard across our network. But with the mTicket app, there are double discounts available too. It’s mobility for the mobile generation - and it means the kids no longer need to rely on the taxi of mum and dad! mTickets are a smart & simple solution, whether it’s to take care of the school run, or for heading into town at the weekend. We’ve got Dundee’s youngsters covered ‘til their 19th birthday. Young people can get double discounts with mTickets. To keep things simple, we ask to see your Young Scot card as proof-of-age. Without it, U19 mTickets may not be valid for travel. Visit young.scot to apply if you don’t have one. Students can get double discounts with mTickets. To keep things simple, we ask to see your matriculation card (which must include a photo and expiry date). Without it, Student mTickets are not valid for travel. Where can I use my mTicket? You can use your mTicket on any Xplore Dundee services. How to I purchase an mTicket? The product menu is split into the following menus: Adult; Group; Child (& Young Person); and Student. Select the one that is right for you, and then select the product you wish to buy. Prices are clearly displayed next to each ticket type. Payment will be taken by debit or credit card at the time of purchase; it is not possible to add the value to your mobile phone bill. If you buy the wrong product, contact us for assistance by calling 0121 254 7272. Will you store my card details? Only if you choose to. At the end of your purchase, you will be given the opportunity to store your card details for quicker future purchases. Don’t worry: your details will be stored securely using non-reversible encryption. You can change or remove your details, or add another card, at any time. How do I use my mTicket? Once purchased, you will find your tickets in the Ticket Wallet section. Select the one you wish to use and make sure it is activated. The driver will need to see the moving digital clock on the tri-colour background. Please note: multi-journey mTickets are valid immediately after purchase; single journeys expire 30 minutes after activation, so make sure you only active just prior to boarding the bus. Single journeys can be stored in your Ticket Wallet for up to 90 days (but they expire 30 minutes after activation). Multi-journey tickets take effect on the date of initial purchase. If more than one multi-journey ticket is purchased in a single transaction, the first one will take effect from the date of purchase, and the rest will remain in your ticket wallet. No refunds will be given for mistaken advance-purchases which take immediate effect. Which mobile phones can I use? iPhone and Android devices both support the mTicket app. For iPhone users, your operating system needs to be iOS8.0 or higher and for Android users, your operating system needs to be 4.4 or higher. Does it matter which mobile network I use? No. 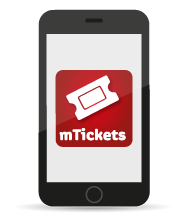 Our mTicket app can used across any and all mobile networks. What if my battery runs out? This is just the same as losing a paper ticket. If you are unable to display your mTicket to the driver or a member of staff upon request, you will be required to pay the cash fare for your journey. This will be non-refundable. What happens if I lose my phone, I upgrade my device or I change my phone number? You can transfer your account to a new device. Download the app on your new device, enter your account details and you will have the opportunity to transfer the contents of your ticket wallet. Your account will automatically be signed out on the old device. You can transfer your account between up to three devices - but only one will be signed in at any-one time. If you require a fourth transfer, please contact us for assistance by calling 0121 254 7272.